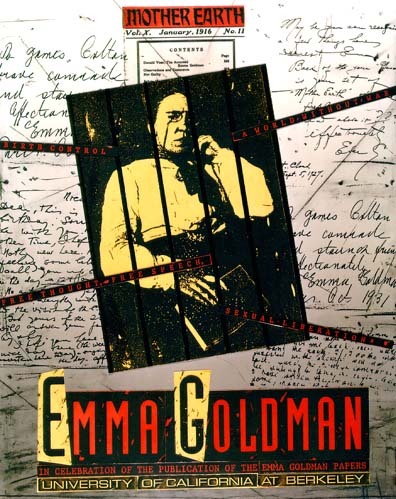 Jeremy Sutton's original design was chosen by the Emma Goldman Papers Project for its first commemorative poster, launching the commemoration of the fiftieth anniversary of Emma Goldman's death and the publication of her papers in 1990. This engaging portrait captures the pensive Goldman, whose vision of freedom catalyzed millions to action. All proceeds from the sale of this poster support the ongoing work of the Goldman Project. This compelling design by artist Maria Giannopoulou evokes the spirit of Goldman's passion and politics. 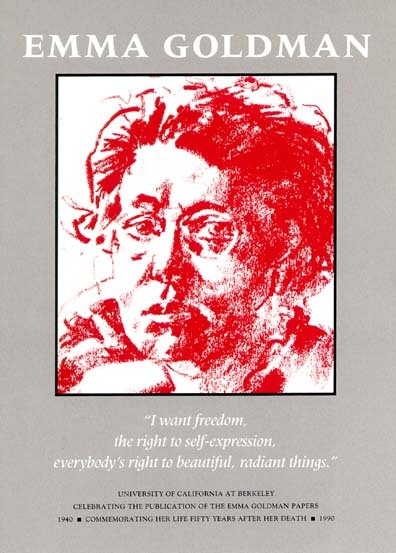 Drawing a parallel with women's current battle for reproductive rights, the commemorative poster design was in part inspired by Goldman's courage to promote birth control, despite the great risk of arrest and imprisonment.